SEREMBAN (Sept 09): PR1MA Malaysia Corp’s Seremban Sentral will be similar to KL Sentral, which blends housing and commuting facilities for its inhabitants. PR1MA chairman Tan Sri Dr Jamaludin Mohd Jarjis said today, that the development — a joint venture between PR1MA, KTM Bhd (KTMB) and Brunsfield International Group — will see 3,196 high-rise residential units being built behind the KTM station here. The project will sit on 57 acres (23.1ha) of land belonging to KTMB, and will provide easy access to train as well as bus services. There will be a retail mall, health and medical facilities, an education campus, parks and a hotel adjacent to it. "It is like KL Sentral," he told a press conference, before the groundbreaking ceremony of Seremban Sentral today. It will also sport park-and-ride facilities, not only for residents but also commuters, based on the request of KTMB, said Jamaludin. He said the units, between 805 sq ft and 1,214 sq ft, will be sold 20% below market value, adding that PR1MA is still working out the cost of the project, based on what the applicants can afford. 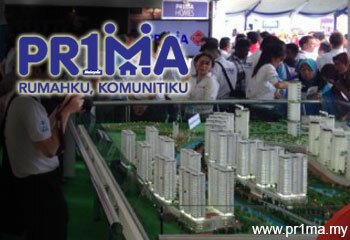 Jamaludin said PR1MA is also eyeing Port Dickson, Jempol and Kuala Pilah, to construct affordable housing there. Jamaludin said PR1MA, which plans to build 80,000 affordable homes in 2014, is in the midst of conducting surveys with its target market, to quantify the type of housing that is in demand. Meanwhile, Prime Minister Datuk Seri Najib Razak, who officiated the event, said Sime Darby Bhd has offered a plot of land measuring some 1,000 acres in Labu, also in Negri Sembilan, to PR1MA, for the construction of more affordable housing.